As with any aspect of commercial property and real estate, your commercial roof is a valuable asset that not only requires routine maintenance and care, but should also be protected in the event that any damage should occur. Roofing warranties are a great way to protect against damage from natural causes, including roof wind damage, storm damaged roofs, hail damage to roofs and more. When you have a quality warranty on your commercial roof, you can rest easy knowing that your important, valuable roof will be properly inspected and repaired to like-new condition by a team of qualified, experienced roofers who have years of skill working with damaged roofs, such as the Zenith Roofing team. However, when it comes to repairing your damaged roof and scheduling inspections to assess any possible harm, it is first important to fully understand the different types of roof warranties available so you can determine what services your warranty will cover. A Contractor’s Workmanship Warranty, also referred to as a “Labor Warranty,” is typically issued by the contractor himself who is installing the roof, and the guarantee usually covers all material and labor defects. These warranties are usually shorter in length than others (ranging from 1-5 years typically.) However, they are one of the most valuable warranties for building owners, as they cover instances of defective materials and defective workmanship. A Manufacturer’s Material Warranty is issued by the manufacturer and typically covers defects of materials, but not labor defects. This means that if your roofing materials fail whether because of manufacturing defects or premature aging, you will have coverage. These warranties typically last between 10 to 30 years. However, a major problem with this type of warranty is that it does not cover any problems past the materials, and the warranty itself could have no use if it can be determined that the leak was caused by the roofing material manufacturer, not the application. A manufacturer’s system warranty is also issued by the manufacturer, but covers both roofing material and labor defects, making the warranty itself much broader when it comes to covering certain instances of defective workmanship. These warranties typically last between 10 to 30 years, but excuse contractors from liability for damage after just two years. Many system warranties also exclude leaks from roof components that are not produced by the manufacturer, including pitch pans, flashing, edge metal, coping metal, and other commonly leaking roof penetrations. 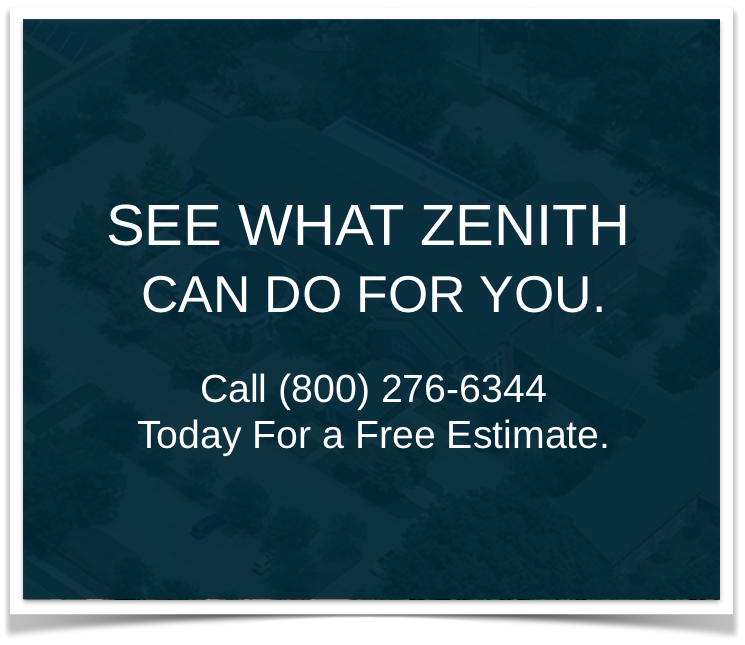 If you are interested in learning more about the different types of commercial roofing warranties that are available to you, or you would like your commercial roof inspected for repairs, contact the experienced roofing experts at Zenith today. We have 30+ years of experience working with insurance companies and the various types of roofing warranties, and we can help to bring your commercial roof back to like-new condition after damage has occurred. We also understand all of the different factors that insurance companies require on roofing claims, and can walk you through the insurance claims process. Therefore, be sure to contact Zenith Roofing today for all of your commercial roofing warranty, inspections and repair needs. For more information please fill out the form below, or call us at 1-800-276-6344.